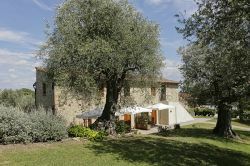 The agri-touristic part of "Il Falcone" consists of two antique farmhouses, called "Casa del Pastore" and "Casa dei Contadini", which in 2002 have been completely restored. During the restoration works were obtained in total 8 apartments for small families composed of 2 to 4 or 5 people. 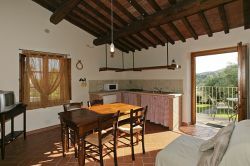 The apartments are furnished in the typical Tuscan country style. All the apartments have their own outside space for relaxing and dining. Furthermore, they are equipped with central heating and microwave in each kitchen. In the garden there are two barbecue spots and in the midst, between the century-old olive trees is situated the pool, from where one can enjoy a marvellous view over the medieval village of Suvereto. 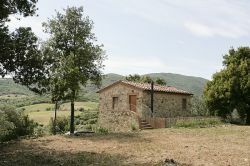 The house is ideal for a small family comosed of 2 adults and one child; it is possible to add an extra bed for the child. Every apartment takes the name of an antique farm tool that is hanging on the wall of the living room. 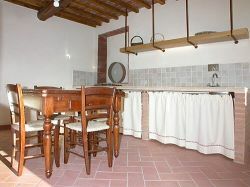 Two of the apartments (the 3-roomed "La Stadera" and the 2-roomed "Il Palmolone") are equipped for handycapped people. The apartments on the ground floor have their own outside space with table and chairs for outside eating in front of the apartment, wheras the apartments on the upper floor have their own outside space in the garden. 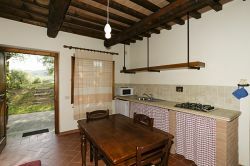 The farmhouse "Casa dei Contadini", near the main house of the farm, is composed of 2 two-room apartments and 4 three-room apartments. The house is ideal for a small family comosed of 2 adults and one child; it is possible to add an extra bed for one child. The house is ideal for a family comosed of 4 people and one child; it is possible to add an extra bed for one child.